"We don't drift towards our goals." We believe that and want to help you grow and be challenged. Our growth track has been designed to help you reach your goals as a follower of Christ. You are invited to attend First Step in the Fireside Room (just past the Level 4 restrooms) at 9:15 a.m. on Sunday, September 16. 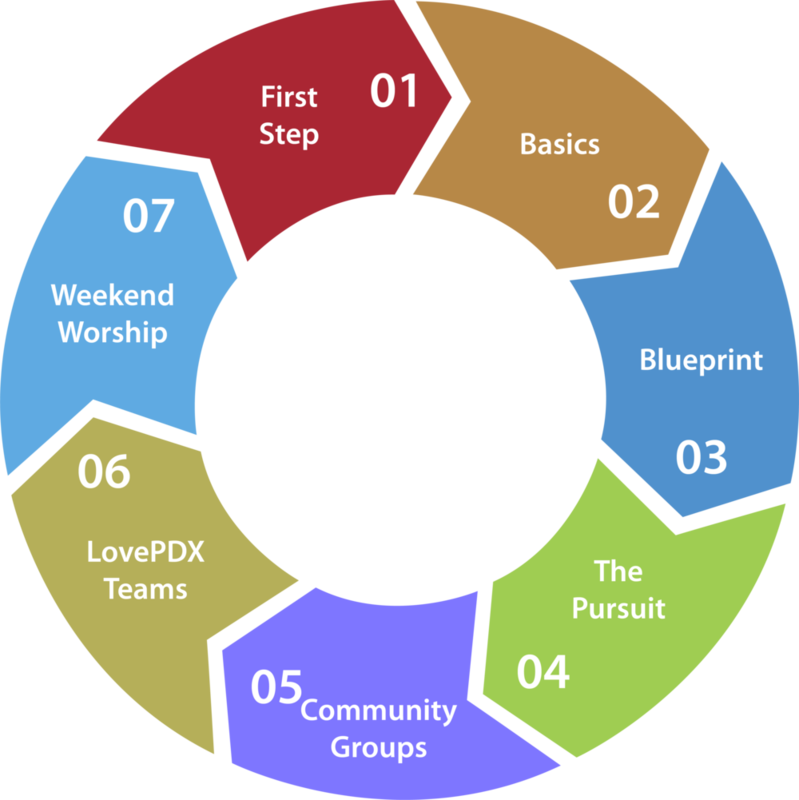 First Step is designed to provide you with more information about the ministry of PDX First and help you find ways to get connected with others. We would love to have you join us for this brief workshop taught by Robb Gossen, Next Gen Pastor. The Basics workshop is designed to give you all the basics of our faith: the basics of salvation, an overview of the Bible, a brief Biblical history, tools for studying the Bible and ordinances (sacraments). But perhaps one of the most helpful component to The Basics workshop is the opportunity for you to ask any questions you might have concerning Christianity, the Bible, other religions, etc. You will love this four-week workshop at PDX First! Have you ever sensed that your life was meant for more than you are currently experiencing? We are all created to live an abundant life in Christ Jesus, but how do we get there? Blueprint is a one day workshop designed to help you create and execute a life plan. Not just any life, but the life God created you for! The workshop will help you evaluate your God-given goals in the following key areas of your life: spiritual, relational, physical, financial, and vocational. The Pursuit is an in depth course of study that goes through the Bible as a collection of stories that shape our faith. Lead by biblical scholars from within PDX First, The Pursuit will open your eyes and your heart to the culture by which Jesus lived and breathed, and why ,and how He spoke in the authority He did. In order to for you to grow you need to be surrounded by people who keep you accountable and want the best for you! Time to get plugged in. #LovePDX isn't just one week reaching out into our community. It's a heartset we've chosen to carry as a mantle of love, justice, and help for the city and surrounding areas of Portland Oregon. We regularly look for ways which we can team up with ministries around us and be a help and benefit wherever we can. If you're new to PDX First it's likely your first experience was through our weekend worship service. So much goes into creating an atmosphere of hospitality and growth. This is a great way to begin volunteering and helping to continue a culture of love and expectance we long to known for.